. You don’t have a business plan and know you need one.
. You’ve tried to do a business plan the “traditional way” and you got stuck, overwhelmed, or demotivated.
. You already have a business plan, but you need to breathe new life into it.
. or you’d be a heck of a lot happier planning your business in the same intuitive, authentic, and expressive way that you live your life. Detailed, do-able assignments that consider all parts of a business plan. Intuitive exercises and inspiring materials that tap into your natural creative genius. 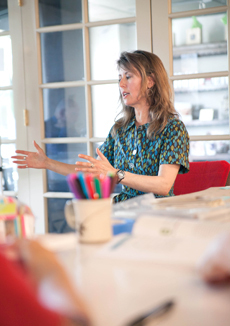 Hands-on support, guidance, and accountability from an experienced certified coach and course facilitator plus the wisdom and perspectives of your fellow mates. 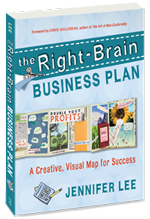 A copy of the book The Right-Brain Business Plan plus all art materials, illustrated play sheets, and other fun art supplies you’ll need. We’ll get our hands dirty. This is a treat… time to work on your business, instead of in it. See where the magic takes you. There’s no telling! But I know it will be GOOD!! Some more client feedback . . .
"I feel like I really have a clear purpose for sharing my art photographs." " This was a fun, visual way to discover what is really important and what is not in my career and in my business." "Loved it all! Prepare to be dazzled!" "I learned so much listening to others in the group. Lori brings a bright, intelligent energy with great acceptance and listening. I love how her other training broadens the subject matter and gives it greater depth." "If you want to learn about business in a non-threatening, helpful environment, this class is for you. Lori will help you find your true direction." " An effective way to determine business strategies, your to-do list, and how to make money. Practical advice for building a business centered around your passions." "More than just getting your business going or redirecting it, the course defines you within the context of your service or product and propels you to new heights of purpose and passion." "This class makes looking at business possible, do-able. It takes away doing it "right." It addresses wherever the individual is starting from, their point of departure."